Gaby Brimmer, An Autobiography in Three Voices by Gaby Brimmer and Elena Poniatowska will be out on June 15, 2009. 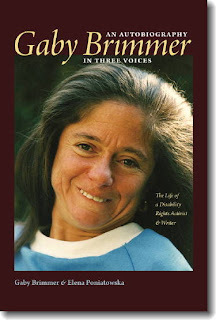 Gabriela Brimmer (1947–2000), born with cerebral palsy, communicated largely by typing with her left foot on an electric typewriter, and by using that foot to point at letters and numbers on an “alphabet board” at the base of her wheelchair. Raised by her mother, Sari, and Mexican caregiver Florencia Morales Sánchez, Gaby gained admission to Mexico City public schools, attended the prestigious National Autonomous University of Mexico, and became a key figure in launching Mexico’s disability rights movement. With the text structured by renowned writer Elena Poniatowska to alternate Gaby’s voice with those of her mother and Florencia, this volume is both the memoir of an extraordinary woman and a unique and imaginative form of autobiographical writing. “Gabriela Brimmer moved her big toe to craft poetry and moved the world to defend the disabled. Elena Poniatowska bends the rules of journalism to tell her story in a polyphonic memoir ... Humbling and admirable!” says Ilan Stavans, Lewis-Sebring Professor in Latin American and Latino Culture, Amherst College. “Gaby Brimmer’s story is perhaps one of the most deeply human testimonials Elena Poniatowska has published. Moreover, it is a story that has been crucial to the disabled rights movement in Mexico. Trudy Balch’s excellent translation brings Gaby Brimmer to the fore again, and it is my hope that it will contribute to the nascent field of Latin American disability cultural studies.,” says David William Foster, Regents' Professor of Spanish and Women and Gender Studies, Arizona State University.